The lighthouse itself at Graves would be an engineering masterpiece: A round tower, with walls 7 feet thick, built of 776 interlocking blocks of granite, and held in place with massive steel bolts 4 inches in diameter. 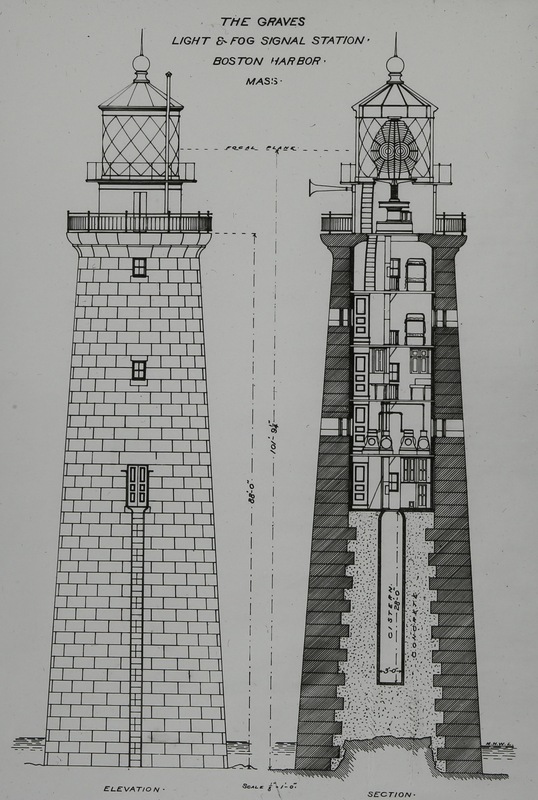 The lighthouse would be almost a larger twin of a beacon being built at Ram Island Ledge, Maine. Graves Light would rise 113 feet from the sea, topped by a 3.2 million candlepower first-order Fresnel lens and a trumpetlike foghorn. Graves Light could comfortably accommodate a full-time crew of four men. The five interior levels included an entryway/storage area 40 feet above sea level, an engine room, a kitchen, a bunk room, and another bunk room. Above them, in the metal top, was sixth floor to operate the rotating mechanism of the light that doubled as a library with its own observation deck, and finally, the lamp room containing a 12 foot-high first-order Fresnel lens. Twin cisterns of 1,500 gallons each would hold drinking water for the crew, and compressed air for the foghorn. Below is a large image of the original architectural sketch, provided to GravesLightStation.com by the Massachusetts Historical Society.